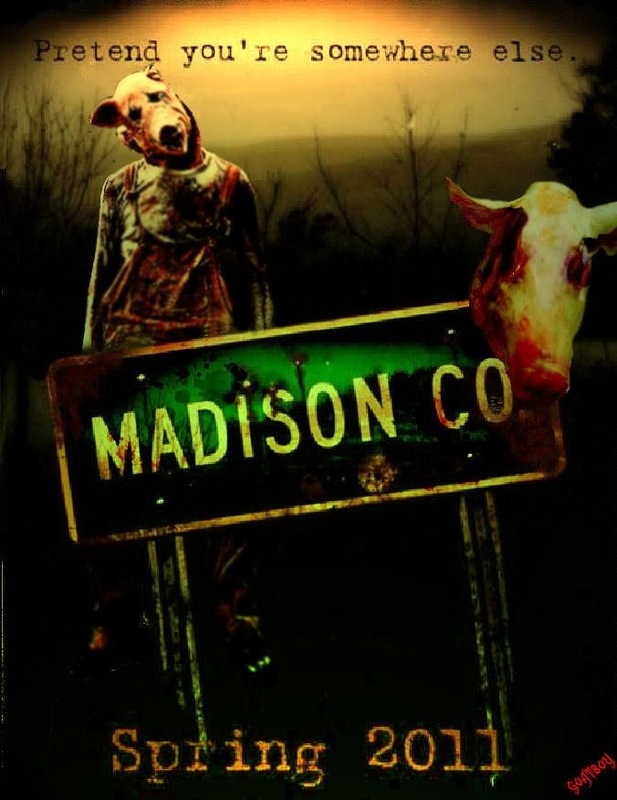 Madison County was made on a budget of only about 70,000 and was released on the festival scene in 2011 and got its video release in 2012. Going into the movie I wasn’t sure what to expect since the good majority of low budget horror films more often than not have mostly been lousy since the end of the 80s. Well the 90s offered some fun low budget flicks, but as the 90s went on low budget films were becoming Z-grade shlock. While funding is never easy there are outlets to raise money and more methods to shoot on rather than film. So I’m always skeptical of low budget horror movies these days. Madison County turns out far better than the majority and while the film wasn’t perfect writer/director Eric England showed a lot of potential. 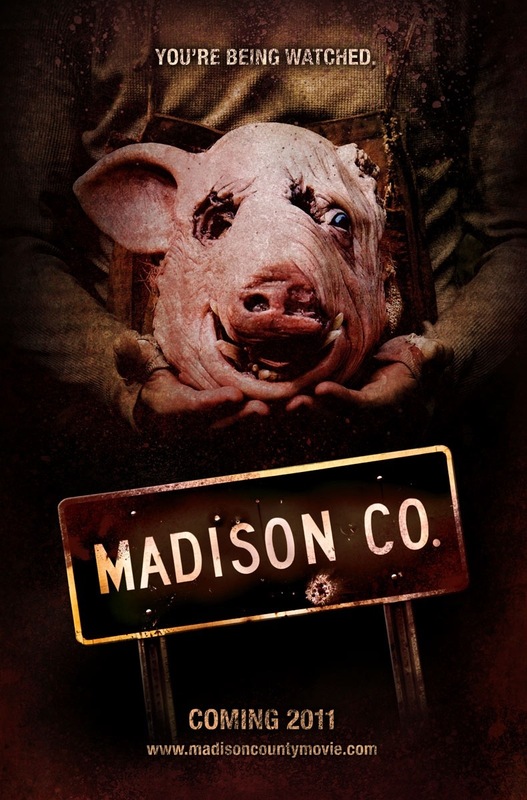 Madison County takes elements of such movies as The Texas Chainsaw Massacre and other backwoods horror films and if anything the biggest problem is Madison County never really does anything to stray from the norm. The plot finds some college kids heading to a small town called Madison County to interview the author of a book who wrote about a series of murders that took place on the town. When they can’t locate the author the townspeople deny murders ever took place there and the college kids begin to look into things in their own and soon they become targets. The script by Eric England focuses more on characters rather than violence, which might turn some people off, but I quite liked that. Around the early to mid 80s it became about carnage, whereas Madison County puts more into the characters and therefore makes them more sympathetic when they are killed off. The characters may not have the most depth, but they have personality and are in my opinion the more likable characters than we are used to seeing in this style of film. The only real problem I have is it never strays from the films it was inspired by, but overall England writes an entertaining film. As director Eric England delivers a well made film and while the films low budget origins show it never looks cheap. The pacing is fairly strong though there are moments when the film can lag, but England always manages to keep the film from getting too slow. Once the action kicks in the pacing picks up and there are some really solid scenes with decent suspense as well as some excellent gore scenes. I think the turning point of the film for me was the death of Jenna (Scheetz) who showed a lot of bravery and I really felt bad for her and if a filmmaker can get that emotion out of me they did something right. My only complaint are too many daytime scenes, which does hinder the suspense at times. I don’t know if this was a creative reason or budgetary. Many horror films have pulled off eerie or scary scenes during the day, but as a whole it never fully works. But despite that complaint Madison County in well made and a cut above the good portion of low budget horror movies released these days. 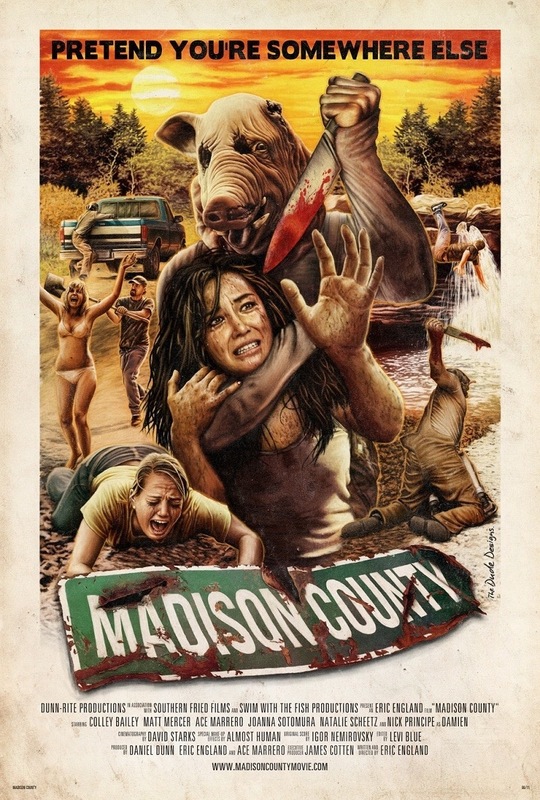 Overall Madison County was a nice surprise and while the film isn’t great it is well made and Eric England is only in his early 20s and for such a young filmmaker he does an excellent job putting together this production and I look forward to his future projects.